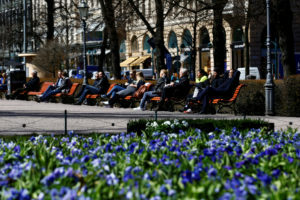 HELSINKI — Finland has topped an index of the happiest nations for the second consecutive year, with researchers saying the small Nordic country of 5.5 million has succeeded in generating a happiness recipe for a balanced life not simply dependent on economic and material wealth. “The worldwide tendency of a considerable decline in average happiness, despite the general growth in GDP per capita, is proof that measuring happiness and life satisfaction in terms of economic wealth alone is not at all sufficient,” said Meik Wiking, CEO of think tank The Happiness Research Institute in Copenhagen, Denmark, who took part in the report. WATCH: Does Denmark live up to its title as the happiest nation?